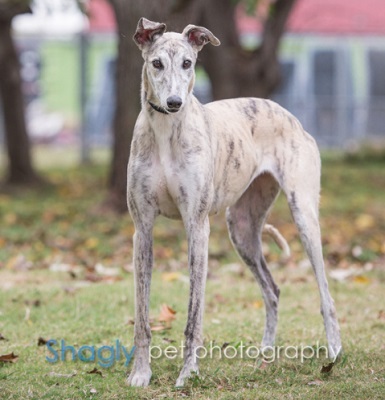 Joy is an 8 year old light brindle female born in 2009. She was part of the population from the blood bank facility located in Cherokee, TX that closed in November 2017. Joy is being medically evaluated by GALT's veterinarians and will complete her medical procedures soon. Joy is not considered to be small animal or cat tolerant. 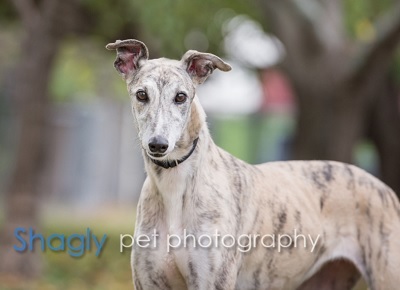 Please check back periodically for updates on Joy as her journey to a forever home unfolds. If you are looking for Joy, look no further. Joy is such a sweet, beautiful girl. She loves people, stuffies and food. She is very playful and loves playing with stuffies. She collects them from around the house and likes to toss them in the air. She is a quick learner and learned the ropes of her new foster home very quickly. She has no problem with stairs and has not had any accidents in the house. She is very social and likes people. She will greet visitors kindly. She also has very good manners. While she is inquisitive, she never thinks to counter surf or get on the furniture. She does like to eat. She will let you know when it is dinner time by laying in front of her food bowl and looking at you until you acknowledge her. She does well with other dogs and is small dog tolerant. However, she would also do well as an only dog. She is crate trained. At first, she didn't like being in her crate, however, now enjoys it and often times we find her in her crate lounging with her stuffies. She is excellent on a leash and enjoys walks. Joy is also great with kids. She doesn't get startled easily and likes attention. If you are looking for an easy transition, Joy is the one. All she needs is love and a few stuffies.